9 August 1387, Monmouth Castle. Mary de Bohun (1369 - 94). 2 June 1420, Troyes Cathedral, France. 9 April 1413, Westminster Abbey. Body of Richard II reinterred at Westminster Abbey, 1413. Battle of Agincourt, 25 October 1415. 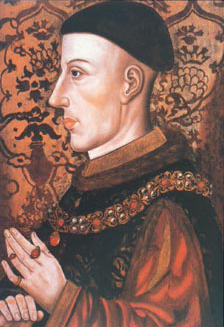 Treaty of Troyes, secures Henry V's succession to the French throne, May 1420.